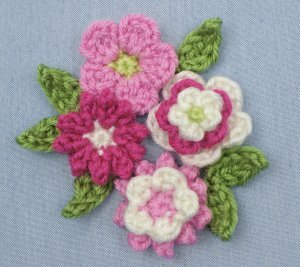 Posy Blossoms is an original crochet pattern by June Gilbank. This is a versatile mix-and-match pattern to make sweet miniature flowers in seven designs with two leaves. Make each blossom in one or two colours of your choice; stack the smaller blossoms on the larger ones in the same or contrasting colours; combine your blossoms into a unique posy. Wondering exactly how to create accessories like these with your Posy Blossoms? Try my Crocheted Embellishments tutorial. It walks you through how to create clustered embellishments and attach them securely to hardware such as hair clips, barrettes, hairbands, pin backs. Cute, easy to make flowers! A great go-to for embellishments.